1,Full length zipper design,three traditional back pockets for storage. 2,This cycling jerseys are great fitting functional.The Pro weight Poly and Lycra fabric is heavy, durable and supportive. EASY MAINTENANCE &SIZE SUGGESTION- Package includes cycling tops t-shirts full-length zipper for ventilation. Wash under 100 degrees F, Hand washing or machine (Put in wash pocket when washing in a machine).Do not brush or bleach for it can affect the quality of your Jersey. PREMIUM & COMFORTABLE - This cyclist's jersey is suitable for all levels cyclists, which includes road biking or mountain biker. Whenever you're sweaty the Jersey never adhere to your skin, It has a quick-dry feature which makes you feel more comfortable. SERVES AS BEST GIFT - This sports sleeve jersey is highly durable. 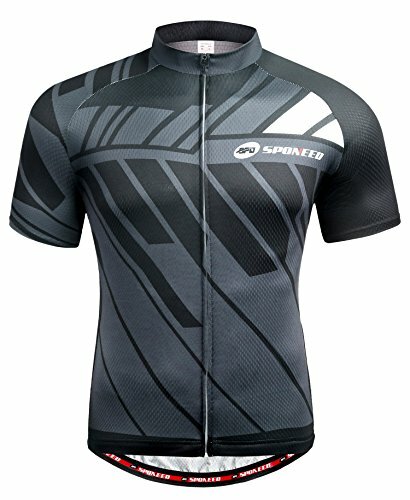 Unlike others this jersey does not irritate the skin, it is designed with skin-friendly materials. This is the best gift to give to those cyclist freak and they will Very much value it. 100% SATISFACTION GUARANTEED - As a brand, we believe in quality our jerseys are definitely worth the cost compare to those top brand cycling clothing, We are cycling supplies manufacturer, we can guarantee top-level quality and good design. If the size unsuitable issue please contact us freely we will provide new size for you very convenience. If you have any questions about this product by sponeed, contact us by completing and submitting the form below. If you are looking for a specif part number, please include it with your message.